Volunteer student diver Bob Mackintosh inspects the damage to the bow of the Thesis during SAMPHIRE 2015 fieldwork. 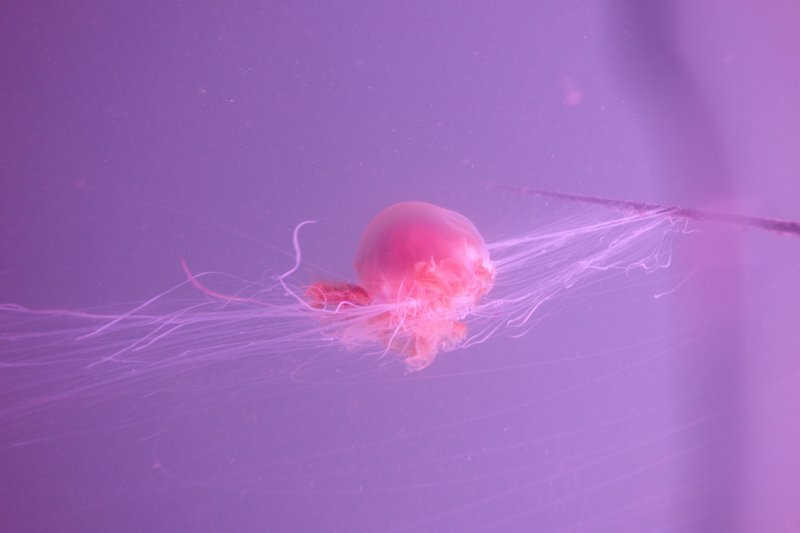 Photo: J. McCarthy (© WA Coastal & Marine 2015). 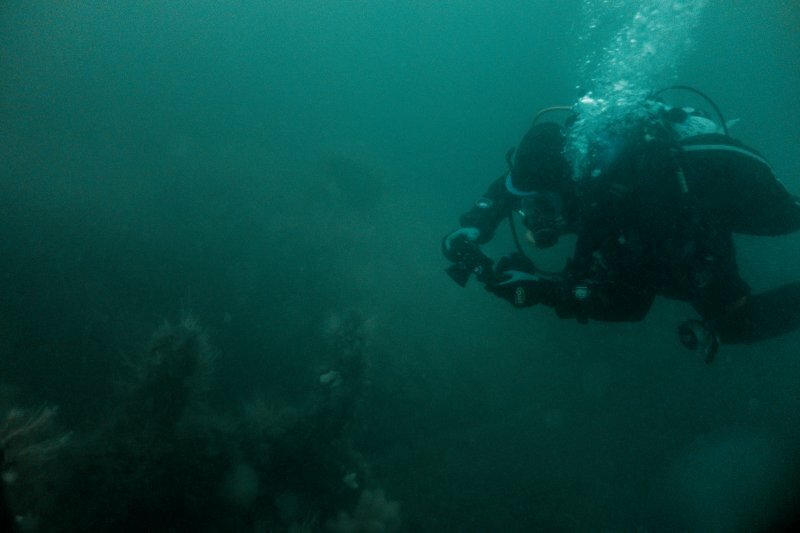 View of two divers from the Sound of Mull Archaeological Project surveying the wreck of the S.S. Thesis. Sound of Mull [name centred NM 58 46]. Formerly entered as Site no. 8578. About midnight on Tuesday, the steamer THESIS, en route from Middlesbrough to Belfast, struck a reef at Inninmore Point [Rubha an Ridire]. The vessel was loaded with pig iron, and sank in deep water bows first, four hours after striking the rock. The eleven crew were all safe, and landed at Craignure. Source: Oban Times, October 1889. 16 October 1889. THESIS. 2 years of Belfast. Lloyds 100A1. Survey 9/89. Iron steamship. 151 ton. Master G. Wallace. Owner W.A. Granger, Belfast. Belfast to Middlesbro'. Iron ore. Wind S2. Near Barony Point, Sound of Mull. Source: PP Abstracts of Shipping Casualties on Coasts, or in Rivers and Harbours of the UK July 1889-90 (1890-91 [C.6468] LXXVI.485). THESIS, boiler is in place, ribs of the bow are exposed. (Transits for locating the wreck are illustrated in the source). 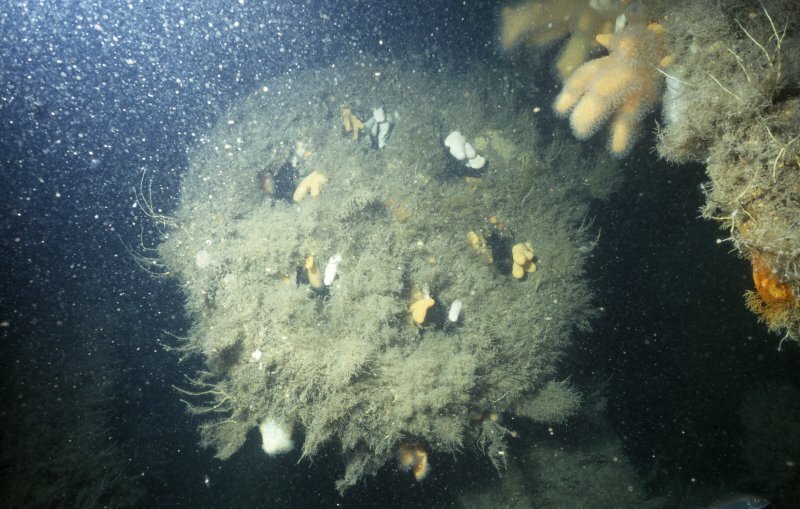 Source: Butland & Siedlecki, BSAC Wreck Register, Scotland 2, 1987. The vessel was wrecked in fog while en-route from Belfast to Middlesborough carrying iron ore. Source: Diver Magazine - 1982. 28 September 1981. The THESIS is the locally accepted name of the wreck - no confirmation. Its position is 56 30 00N, 005 41 30W. The wreck is lying at 90 degrees to the shore with its bows pointing to shore. The bow is in 15-17 metres, the stern in 30 metres. The wreck appears very old with its plates falling off its ribs. Report by W. Mcgregor, lettter dated 22 September 1981. 18 Janaury 1982. The hull is complete. There is pottery in two holds. 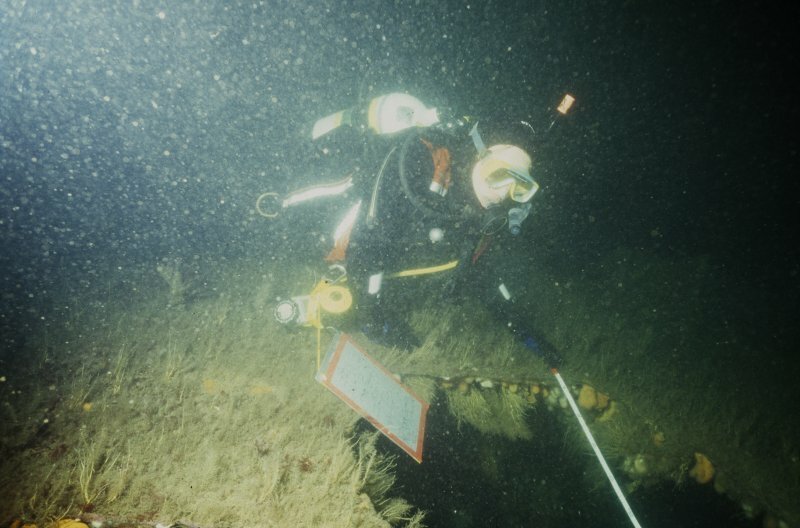 The wreck is lying with 15 metres height in a general depth of 30 metres, about 500 metres SE of Eilean Rubha an Ridire, just south of a small bay. Source: BSAC Wreck Register vol.4. 11 June 1982. The wreck is intact, but very fragile. Its tonnage is given as 500 gross, 151 net. 23 September 1991. The wreck is easy to locate by echosounder. It is stated to have been lost in 1891 [the date differs from above]. 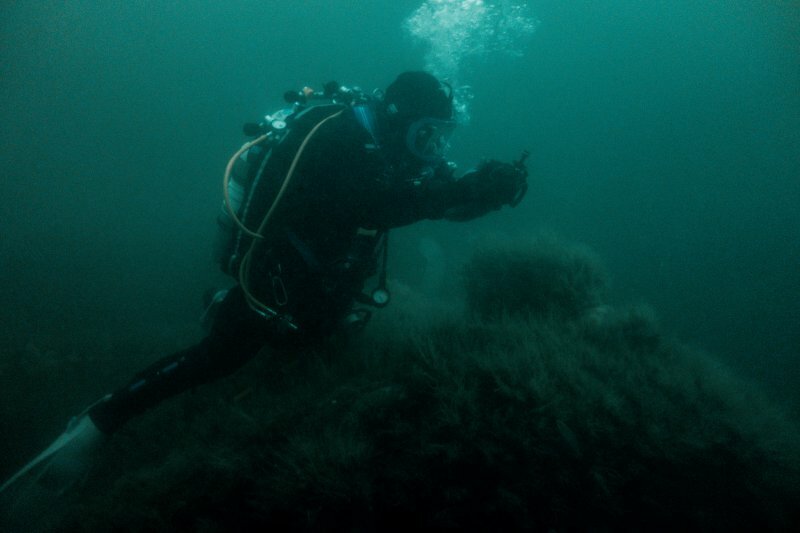 The wreck has bee substantially salvaged by R Grieve of the Salen Diving Centre. Many of the plates are missing from the bows, but still basically intact. The wreck is heavily encrusted with plentiful fish life. Crockery can still to be found. An excellent dive. The tidal stream runs at up to 2 knots. 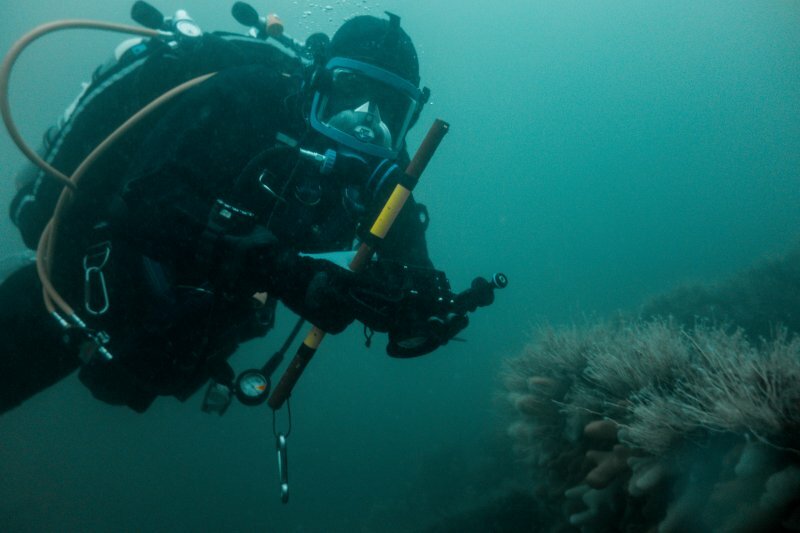 Source: Dive NW Scotland by G Ridley. (Classified as iron steamship, with cargo of iron ore: date of loss cited as 16 October 1889). Thesis: this vessel stranded near Barony Point, and sank off Rubha an Ridire. Capt. Wallace. Registration: Belfast. Built 1887. 378grt. Length: 51m. Beam: 8m. (Location of loss cited as N56 30.05 W5 41.43). A068 1 brass-bound deadlight (from seabed). A3349 1 brass bolt:from seabed. The general (dry) cargo ship is typical of the type and period, and broadly similar to the nearby Shuna (NM54NE 8004) and Hispania (NM55SE 8005), which were built in 1909 and 1912 respectively. 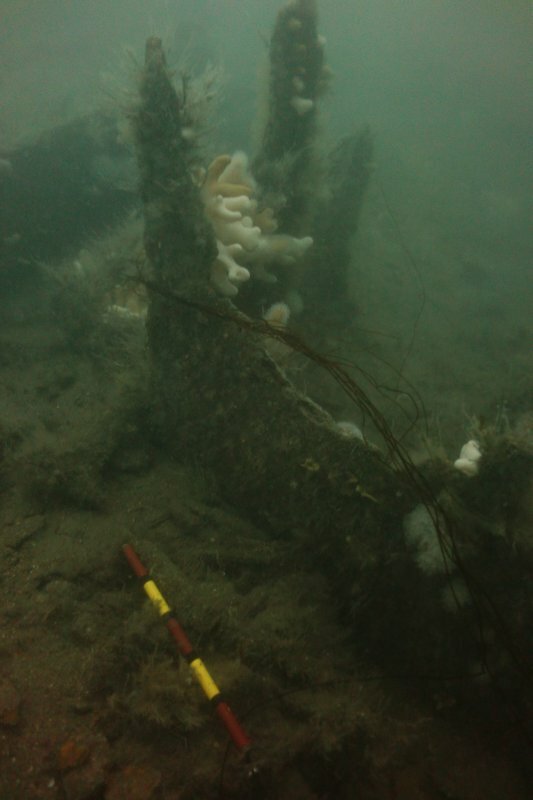 This wreck has essentially been reduced to deck level and much of the hull plating forward has been removed, presumably during extensive salvage operations conducted (date unknown) by Mr Richard Grieve of the Mull Diving Centre, Salen. The remaining identifiable features and fittings comprise the boiler and engine (amidships), the steering gear (aft) and numerous elements of the cargo-handling gear. The rudder and propeller have been removed but the counter stern is impressive. The wreck is not specifically noted on the chart but the indicated location falls on a SW-facing slope above the main drop-off into the glacial trough. The seabed is mixed but generally shelly. The bow points inshore and is in about 22m depth of water; the stern is in about 33m. (For location plan, see Moir and Crawford 1994, 199). Information from RCAHMS (RJCM), 5 November 2002 [visited on numerous occasions 1995 to date]. Moir and Crawford 1994; R and B Larn 1998; Diver 2001. HO chart no. 2390 (1976, revised to 1991). This ship is an example of a once-common type of general cargo ship, of which no examples appear to remain extant. No builders' records appear to survive for the vessel, which is extremely popular among recreational divers. The iron-built steamship was built in Belfast by McIlwain, Lewis and Co, and launched in 1887. Powered by a twin-cylinder engine of 60hp, she measured 50.9m in length by 7.64m in beam, and drew [nominally] 3.53m. While carrying a cargo of pig iron and iron ore between Belfast and Middlesbrough on 16 October 1889, she struck a reef at Inninmore Point before sinking off Batony or Barony Point in the Sound of Mull. The Thesis now lies heeled to port in a scatter of debris with her bows at the foot of a rocky slope leading to the shore; the depth at the deck varies between 12m at the bow and 30m at the stern. The vessel has been subjected to considerable salvage effort and little of the bridge superstructure remains. Much of the hull plating on the forward holds has been lost and some deck plating has also collapsed. 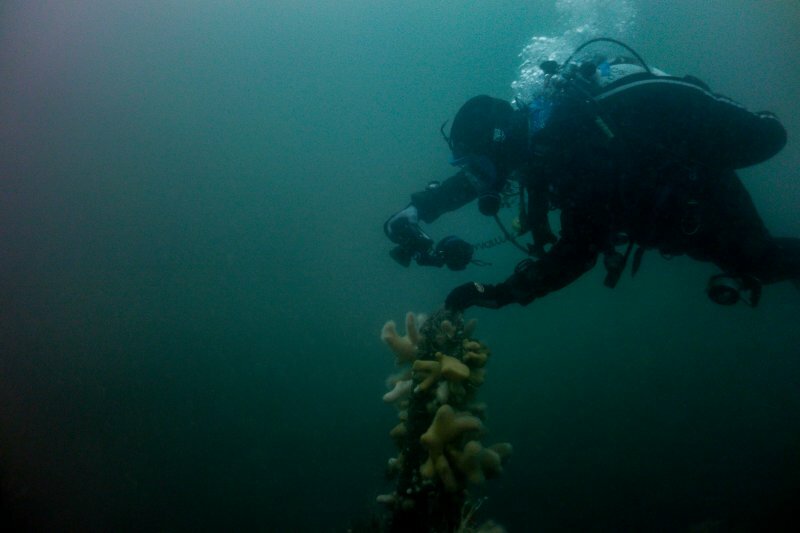 Her remains are heavily encrusted with marine life (including sea-firs and soft corals), and the wreck is subject to strong currents. Study of the Thesis forms part of the work of the Sound of Mull Archaeological Project (SOMAP), the research project of Nautical Archaeology Society Scotland. The wreck has also been adopted under the NAS Adopt-a-Wreck scheme, together with the nearby John Preston [NM64SE 8005]. Survey operations since 2000 have concentrated on drawing a deck plan, two longitudinal baselines being initially set up forward of the superstructure. Operations have been consistently hampered by twisting of the deck and the presence of protruding debris and fittings. In 2002, different procedures were adopted to survey the deeper (aft) portion of the wreck. Nitrox was used for safety and the area was divided into four portions, the sides of the large deck openings forming a baseline. In the event, the total planned length of the vessel was measured as within 0.5m of that documented. 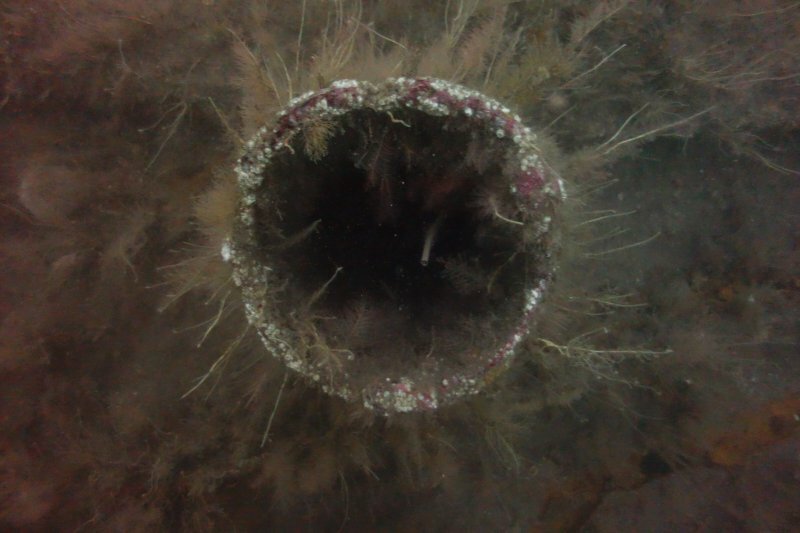 In addition, extensive video footage was taken (by Chris Underwood), a qualitative assessment of the marine biology was carried out (by Craig Burton) and monitoring stakes were put in place around the wreck to establish the pattern or erosion and/or accretion of the seabed. Further discoveries during this work included a stowed anchor (forward) and cracks in the deck (on the starboard side); these latter indicate the start of structural deformation through longitudinal opening. 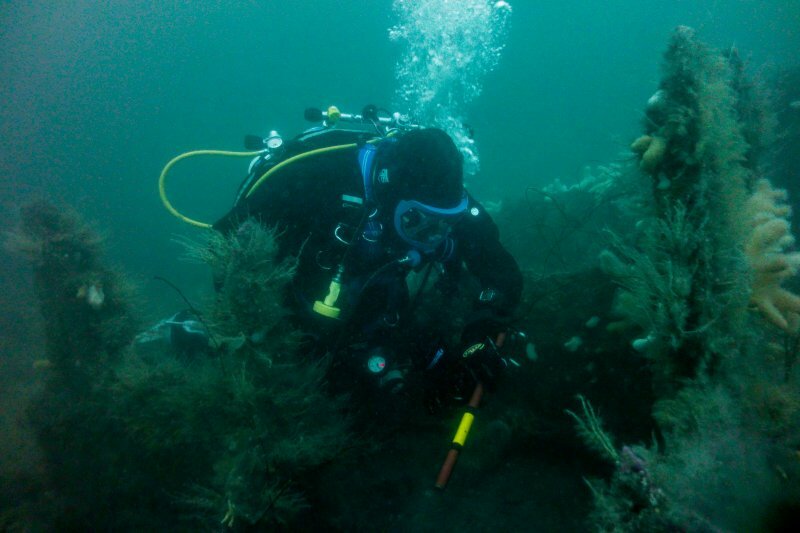 Further research is aimed to refine the current picture of the wreck, to establish a means of interpretation, and to investigate the rate of deterioration. B Kaye and J Cook 2002. R and B Larn 1998; NMRS, VID/32; NMRS, MS/2745. Mineralogical examination of samples of coal and iron ore collected from the wreck of this vessel [in 2004] were carried out by the British Geological Survey, Keyworth, Notts. The coal sample is of medium-volatile coking coal, typical of Westphalian (late Carboniferous) deposits in South Wales, Durham and the Ruhr. This type of coal was typically used for coke manufacture in the steel industry, rather than in fuelling ships, for which purpose low-volatility deposits were referred. This sample presumably derives from the ship's cargo (as against bunkers), and was possibly intended for use in the shipbuilding industry of Northern Ireland. The iron ore sample comprises fragments of haematite and goethite, held together by earthy iron oxide (most probably goethite). Traces of chalcedonic silica and magnetite were present in material which was evidently unsmelted. Magnetite is unusual British ores, but occurs exceptionally in the Rosedale mines, near Middlesborough. (Location cited as N56 29.932 W5 41.515 (WGS84): [NGR NM 7289 4036]). This wreck lies on a sloping gravel seabed. The bow rests on bedrock and stern is embedded into softer gravels, at depths of 14 and 31m respectively below chart datum. The wreck has been the subject of intermittent salvage, and has been popular with recreational divers since the 1980's. Comparative diver survey between 2000 and 2004 during the Sound of Mull Archaeological Project (SOMAP) has demonstrated continuing deterioration and deformation of the forward structure; significant deck collapse is apparent, and the hull is deformed by a twist (possibly by as much as 0.5m) to port in the same area. The sidescan imagery clearly illustrates the holes in the deck where heavy objects (notably winches) have fallen into the interior. It also illustrates well the degree of loss of hull plating, and the form of such features as the engine and boiler. However, comparison of specific measurements from sidescan imagery and diver survey reveals a degree of discrepancy. 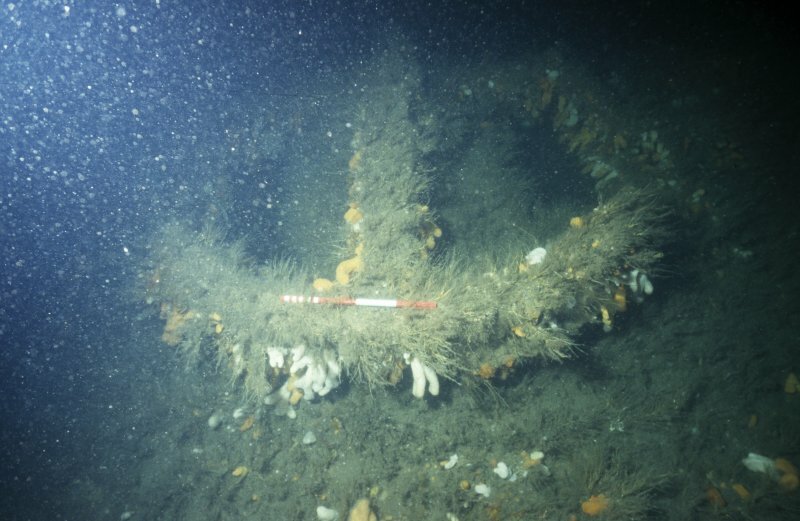 Diver survey has indicated that the stern may lie buried into the silt to a depth of up to 2m; some seabed scour is also apparent along both sides amidships. These findings are confirmed by sonar imagery, although the degree of burial at the stern may be slightly over-emphasised. The sedimentary accumulation at the stern may contain material from the ship's poop, and so have significant archaeological potential. The sidescan imagery indicates areas of exposed reef adjacent to the starboard quarter and at the bow. This suggests that the stern of the vessel is trapping sediment moving SE on ebb tides. Some 'blurring' of the features at the stern is apparent on the imagery; neither the poop nor the trapezoidal void within the stern can be distinguished. Around the bow, the holds, boilers and anchors cannot be clearly distinguished. This may be due to the imagery being derived from multiple passes. In this case, the accuracy of the measurements remains below that required for archaeological survey. (Survey area defined: report illustrated with chart extract and colour sonar imagery. Specific sonar-derived measurements cited in comparison with equivalents from diver survey). MS/2338 (pp. 5, 19-23, 24, 86, 92). 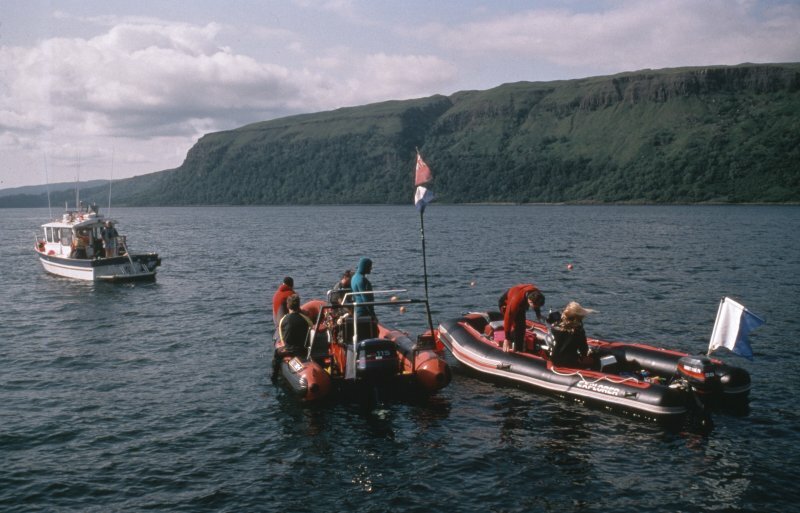 Survey of maritime sites including: Dartmouth: Eilean Rubha an Ridire; Evelyn Rose (Possibly): Ardtornish Point; Glen Carradale: Loch Aline Jetty; Hispania: Sgeir Mor; John Preston: Rubha Dearg; Loch Tearnait, Crannog; Pelican: Calve Island; Rondo: Dearg Sgeir; Shuna: Rubha Aird Seisg; Strathbeg: Cnap A' Chailbhe; Swan: Duart Point; Thesis: Rubha an Ridire; Unknown: Calve Island; Unknown: Scallaslte Bay and a stone quay and Ardtornish. Tape measure and detailed recording of a merchant steamship, Thesis, and the immediate environment by Sound of Mull Archaeological Project (SoMAP). 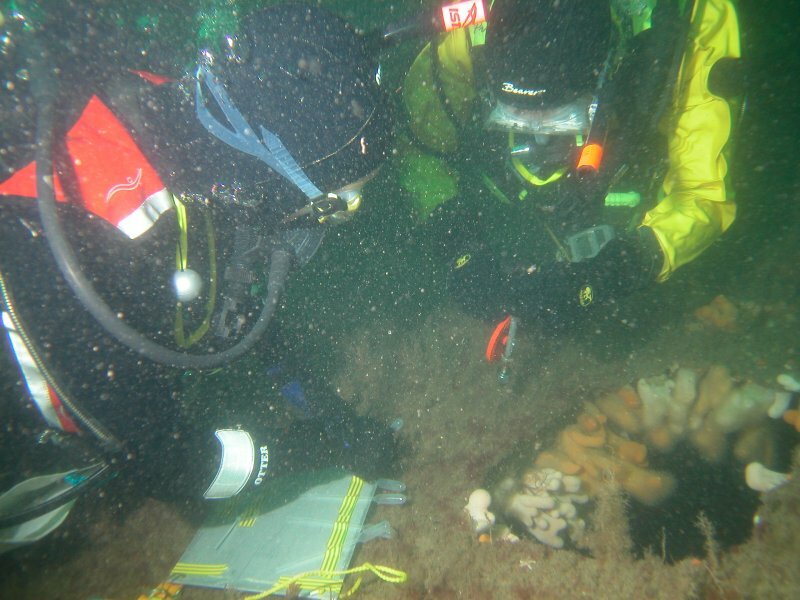 Recording of underwater biological remains by SoMAP members in association with the Marine Conservation Society's Seasearch programme in the immediate environment of the merchant steamship, Thesis. Remote sensing of the merchant steamship, Thesis, and the immediate environment by Sound of Mull Archaeological Project (SoMAP). Circumstances of Loss : **BUILT 1887 BY MCILWAINE LEWIS & CO, BELFAST. OWNED AT TIME OF LOSS BY W A GRANGER, BELFAST. ONE BOILER, COMPOUND EXPANSION ENGINE OF 60HP, SINGLE SHAFT. PASSAGE BELFAST FOR MIDDLESBOROUGH. RAN ONTO A REEF NEAR INNINMORE PT, & SANK IN DEEP WATER NEAR RUBHA AN RIDIRE. CREW OF 12 SAVED. (SIBI, ARGYLL SHIPWRECKS & SHIPWRECKS OF THE W OF SCOTLAND). Surveying Details : **H1310/26/81 28.9.81 LOCALLY ACCEPTED NAME OF WK, NO CONFIRMATION. POSN 563000N, 054130W [OGB]. LYING AT 90DEGS TO SHORE WITH BOWS POINTING TO SHORE. BOW IN 15-17MTRS, STERN IN 30MTRS. WK APPEARS VERY OLD, PLATES FALLING OFF RIBS. (W MCGREGOR, LTR DTD 22.9.81). **18.1.82 HULL COMPLETE. POTTERY IN TWO HOLDS. LYING WITH 15MTRS HEIGHT IN GEN DEPTH 30MTRS, ABOUT 500MTRS SE OF EILEAN RUBHA AN RIDIRE, JUST S OF SMALL BAY. (BSAC WK REGISTER). NCA. **H5249/76 11.6.82 INTACT, BUT VERY FRAGILE. TONNAGE GIVEN AS 500T GROSS, 151T NET. (DIVER MAGAZINE, 1982). **23.9.91 EASY TO LOCATE BY E/S. SUBSTANIALLY SALVAGED BY R GRIEVE OF MULL DIVING CENTRE, SALEN. MANY PLATES MISSING FROM BOWS, BUT STILL BASICALLY INTACT. HEAVILY ENCRUSTED, PLENTIFUL FISH LIFE, CROCKERY STILL TO BE FOUND. EXCELLENT DIVE. TIDAL STREAM RUNS AT UP TO 2 KNOTS. (DIVE NW SCOTLAND, G RIDLEY). **23.3.01 LIES IN 5630.03N, 0541.43W [OGB], ABOUT 50MTRS FROM THE SHORE ON THE W OF RUBHA AN RIDRE. STANDS 3-4MTRS IN 25MTRS. (DIVER MAGAZINE, MARCH 2001). INS AS NDW. BR STD. **HH100/351/19 6.11.02 2 PHOTOGRAPHS SUPPLIED SHOWING MARINE GROWTH ON WRECK. (D BELLMONT, E-MAIL DTD 5.11.02) NCA. **15.3.07 EUT POSN: 5630.020N, 0541.496W. NE 2390. 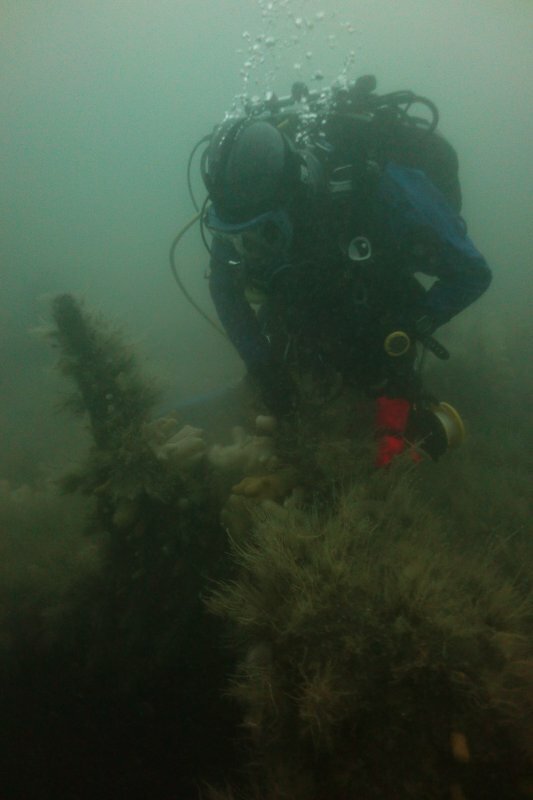 Project SAMPHIRE was designed to bring professional marine archaeological expertise into local maritime communities. 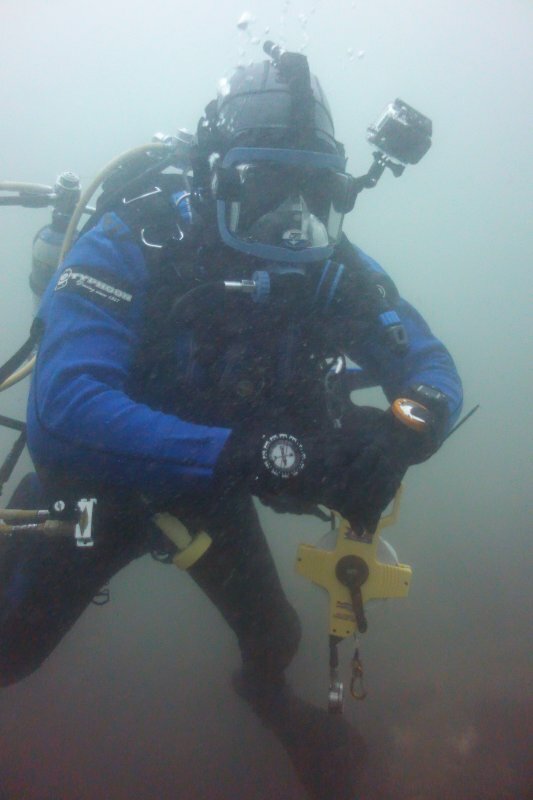 The central focus of the project was to record the unique knowledge of maritime cultural heritage sites on the seabed (and intertidal zone) that is held within local communities. This was done through a programme of face-to-face community engagement, allowing knowledge exchange in both directions. The reported sites were then investigated by the SAMPHIRE Project team with the maximum involvement of local community members at every level, including fieldwork and desk-based research. 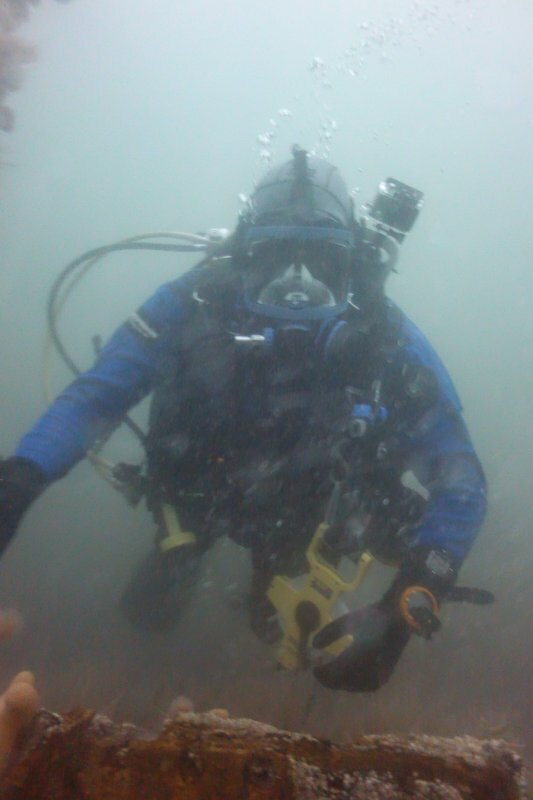 The project aimed to foster a wider understanding of and interest in local maritime heritage and to promote the stewardship of this valuable local resource. The SAMPHIRE team visited the site briefly during fieldwork in 2014 in order to attempt photogrammetric recording of the bow area. This test was not successful, although some photographs of good quality were captured, and no entry was included in the 2014 report. However these images later proved valuable. 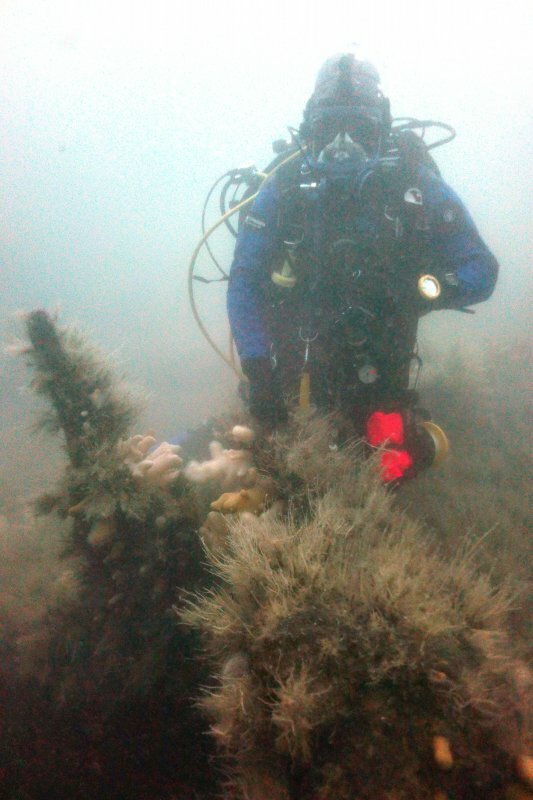 During fieldwork for the diving phase of 2015 in the same area, the SAMPHIRE team were informed by local dive centre operators Mark and Annabel Lawrence that they had received reports from recreational divers in the winter of 2014 that large sections of this well-loved wreck had been destroyed over the winter, and as with the Short Sunderland (see 2015 entry for S90) it was speculated that dredging may have been the cause. 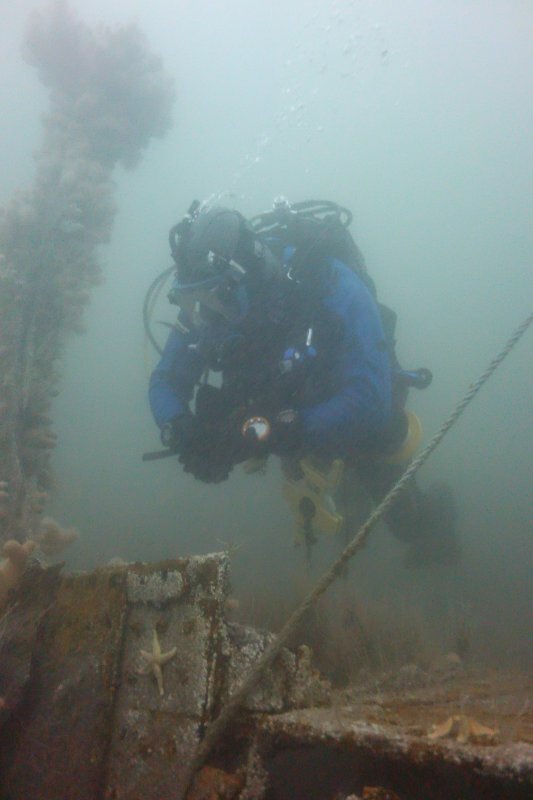 At the request of the dive centre the SAMPHIRE team carried out a short dive in the afternoon and this proved sufficient to establish that there has been a major collapse of the decking around the bow. 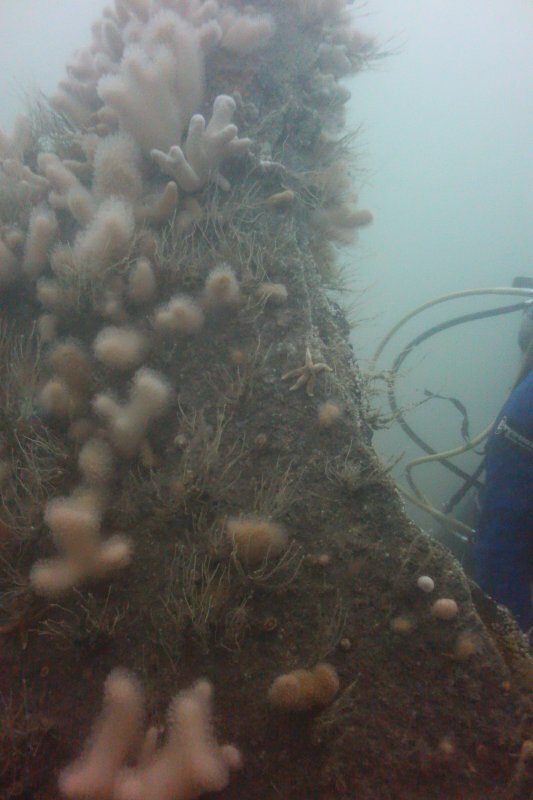 However the fact that the external hull around the bow is still intact and the fragile and highly corroded nature of the surviving elements of the bow structure suggest that the collapse has more likely been due to the natural degradation of the hull rather than dredging impacts. 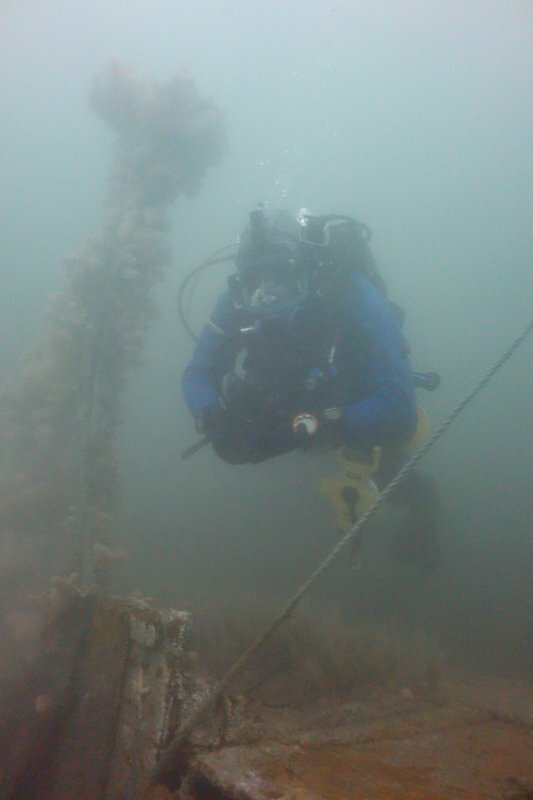 Bob Mackintosh, student volunteer with the SAMPHIRE project, searched around the bows of the wreck. Hydrographic data for this site predating the collapse of the bow was also provided to the SAMPHIRE team by John Howe of the Scottish Association of Marine Science including a H525 report and multibeam data.